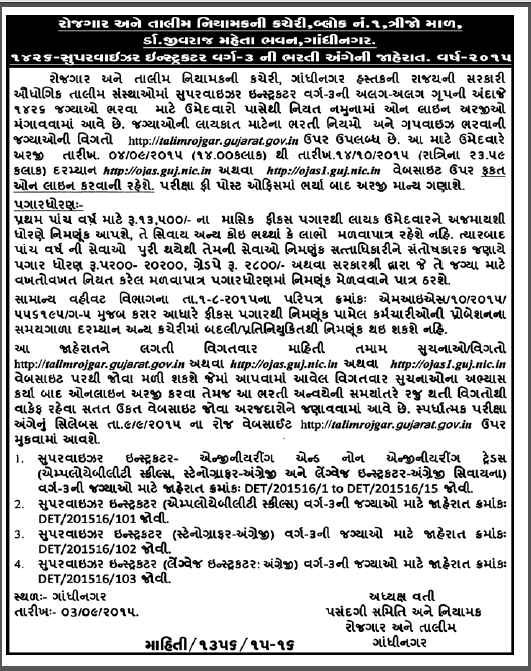 Directorate of Employment & Training,Gujarat has published a Advertisement for below mentioned Posts 2015. Check below for more details. National Apprenticeship Certificate (NAC) or National Trade Certificate 4 (NTC) and National craft instructor certificate (for those trades where courses under craft instructor training courses are available) in each same or relevant trade/group in Appendix A for engineering trade/group or as shown against each same or relevant trade/group in Appendix B for non-engineering trade/groups obtained from Government recognized institute and have experience in relevant field as described in Appendix A or Appendix B respectively. How to Apply : Interested Candidates may Apply Online Through official Website http://ojas1.guj.nic.in.